It has been ten years since Intel introduced quad-core processors into its mainstream product range. It was expected that six-core parts would hit the segment a few years after, however due to process improvements, microarchitecture gains, cost, and a lack of competition, the top-end mainstream processor is still a quad-core a decade later. That changes today. Launching today are Intel's new 8th Generation Coffee Lake CPUs, with the Core i5 and Core i7 parts having six distinct physical cores. In this review we're covering the top SKU, the Core i7-8700K, along with looking at numbers from the Core i5-8400. There are a number of interesting elements to this launch to be excited about, and a number of factors that raise even further questions, which we will go in to. To start, the processor stack that Intel is making available today consists of six desktop processors that all fall under the ‘8th Generation’ nomenclature, and are built under the codename ‘Coffee Lake’ to designate the microarchitecture and manufacturing process combination. All these new processors are desktop parts, meaning they are socketed processors for use in appropriate motherboards featuring the Z370 chipset. 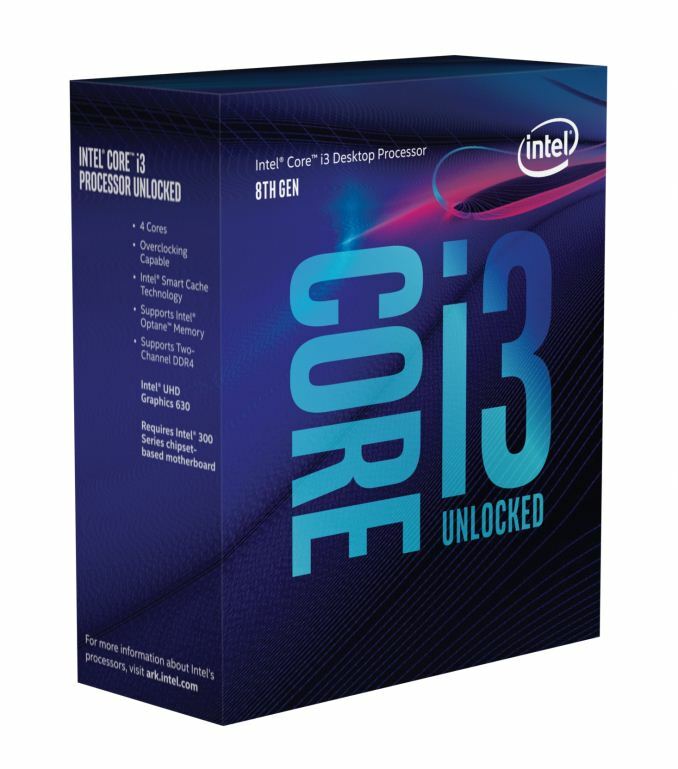 Technically these processors use the LGA1151 socket, which is also used by the 6th Generation and 7th Generation processors with the Z170 and Z270 chipsets. However due to differences in the pin-layout of these two sets of processors, 8th Gen will only work in Z370 boards and there is no level of cross compatibility. We will discuss this later. At the top of the stack are two Core i7 Coffee Lake processors. In previous generations ‘Core i7’ meant that we were discussing quad-core parts with hyperthreading, but for this generation it moves up to a six-core part with hyperthreading. The Core i7-8700K starts at a 3.7 GHz base frequency and is designed to turbo to 4.7 GHz in single threaded workloads, with a thermal design power (TDP) of 95W. The K designation means this processor is unlocked and can be overclocked by adjusting the frequency multiplier, subject to appropriate cooling, applied voltage, and the quality of the chip (Intel only guarantees 4.7 GHz). 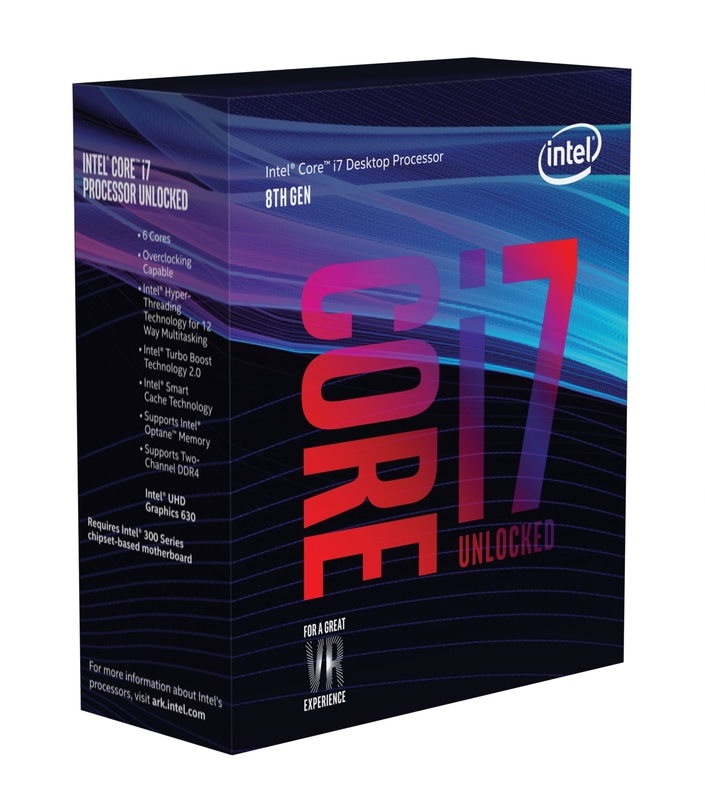 The Core i7-8700 is the non-K variant, with lower clocks (3.2 GHz base, 4.6 GHz turbo) and a lower TDP (65W). Both of these processors use 256 KB of L2 cache per core and 2 MB of L3 cache per core. When compared to the previous generation, the Core i7-8700K starts at a higher price, but for that price comes more cores and a higher turbo frequency. The Core i7-8700K is a good example of how adding cores works: in order to keep the same power consumption, the overall base frequency has to be lowered to match the presence of extra cores. However, in order to keep the responsiveness higher than the previous generation, the single thread performance is often pushed to a higher multiplier. In almost all situations this counts as a win-win, and makes pushing for the 6-core part, on paper at least, a no-brainer. In the middle of the stack are the Core i5 processors, with the new generation matching the ‘same configuration without hyperthreading’ philosophy that followed in the previous generation. 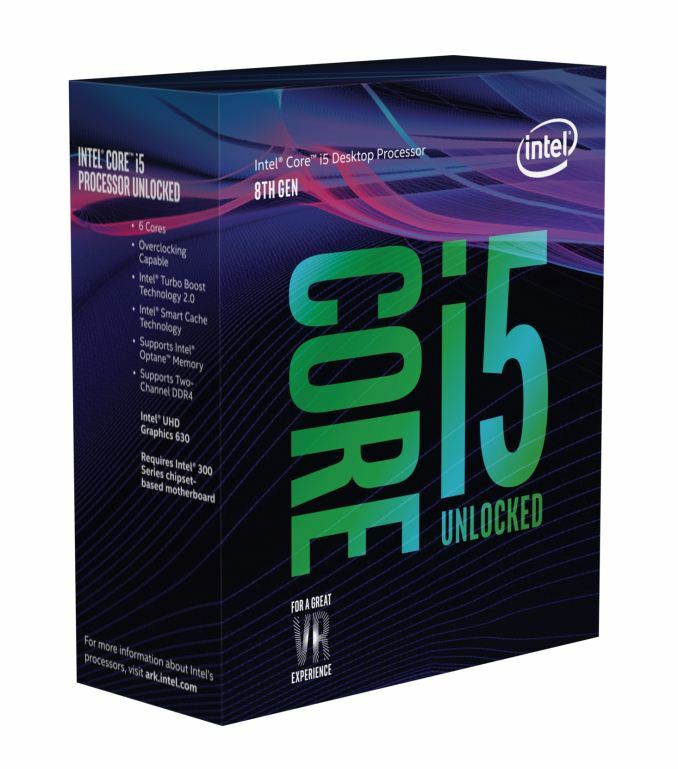 The two Core i5 parts operate at lower clockspeeds compared to the Core i7, and perhaps more so than we are previously used to, especially with the Core i5-8400 having a base frequency of 2.8 GHz. 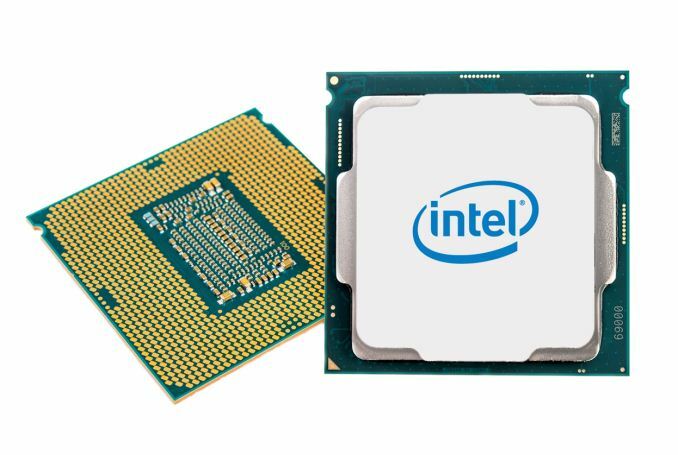 Intel sampled us the Core i5-8400 for our review, because it hits an important metric: six cores for under $200. Comparing cache sizes to the Core i7, the new parts have the same L2 configuration at 256 KB per core, but have a reduced L3 at 1.5 MB per core as part of the product segmentation. It is interesting to note that in the last generation, Intel had processors with two cores and two threads (2C/2T), two cores with hyperthreading (2C/4T), quad cores with four threads (4C/4T) and quad cores with hyperthreading (4C/8T). This layout had staggered, regular steps. With the move to 6C/12T on the high-end Core i7, and 6C/6T on the mid-range Core i5, Intel completely skips the 4C/8T parts and moves straight to 4C/4T on the Core i3. This is likely because a 4C/8T processor might overtake a 6C/6T part in some multi-threaded tests (it would also explain why moving from a previous 4C/8T Core i7 processor to a 6C/6T Core i5 8th generation is not always an increase in performance). However at the bottom of the stack are the 4C/4T Core i3 processors, where Intel is pushing out an overclockable Core i3 processor again. This is a little bit of a surprise: in our testing of the previous generation overclockable Core i3, the fact that it was dual core was a setback in a lot of testing. With the Core i3-K now being quad-core, and overclocking it to try and beat a six-core chip for less money, for certain things like gaming we might see less of a difference between the two. Nonetheless, the Core i3s do retain the policy of no Turbo modes on these parts. Another interesting point is the cache: the i3-8350K has 2 MB of L3 cache per core, whereas the i3-8100 only has 1.5 MB of L3 cache per core. One of our key items to watch in this segment from the initial announcement is that i3-8100. Here is a quad-core processor for only $117. I suspect that this will hit most of the mainstream computing requirements that the previous generation Core i5 (at $182) used to cater for. On paper at least, it seems Intel might have an interesting task trying to explain why more users are opting for a Core i3 this time around. "We are only including processor frequencies for base and single-core Turbo in our materials going forward - the reasoning is that turbo frequencies are opportunistic given their dependency on system configuration and workloads"
This change in policy is somewhat concerning and completely unnecessary. The information itself could be easily obtained by actually having the processors and probing the required P-states (assuming the motherboard manufacturer does not play silly tricks), so this comes across as Intel withholding information for arbitrary reasons. Nonetheless, we were able to obtain the per-core turbo ratios for each of the new processors for our motherboard. Given Intel's statement above, it seems to suggest that each motherboard might have different values for these, with no Intel guidelines given. For the most part, there is nothing out of the ordinary here. Intel uses the base frequency as a guaranteed base under abnormal environmental circumstances and heavy code (AVX2), although in most circumstances even the all-core turbo ratio will be higher than the base frequency. The odd-one-out is actually the Core i5-8400. It is being shipped with a low base frequency, at 2.8 GHz, but the all-core turbo ratio is 3.8 GHz. Shipping with such a low base frequency is perhaps masking the performance of this part: it should be, on paper at least, only a whisker or two behind the Core i5-8600K. It is noticeable that the two Core i7 parts both have an all-core turbo of 4.3 GHz, which is only ever matched by the single threaded turbo of the Core i5-8600K. Not only is moving up from the Core i5 to the Core i7 doubling the threads, but the frequency gain is another addition in performance. The Core i5-8600K has a tray price of $257, while the Core i7-8700 is at $303. Overclocking is lost but the threads are doubled, the available turbo frequencies are improved, the cache goes up, and the TDP goes down. CPU A, $250. CPU B, $300. I’ve been running a little Twitter poll on this. It looks like the Core i7-8700 gets the nod almost every time. For this review today, we are focusing on our preliminary testing of the Core i7-8700K. Intel sampled us both the Core i7-8700K and the Core i5-8400. These chips only arrived three days before launch. They would have arrived sooner, but I was out of the country on a pre-booked business trip and the courier decided to redeliver as late as possible when I returned. So despite some initial motherboard teething issues (again! ), we were able to run our CPU suites and GTX 1080 testing on both chips. We will follow up with data on the other GPUs in the meantime, likely in dedicated CPU reviews, where we’ll include overclocking performance and workstation analysis. So my apologies go out to our regular readers, especially those that have been expecting the usual gargantuan AnandTech reviews. Time and travel are cruel mistresses, and regular scheduled programming should recommence shortly. 2017 has been the most exciting year in a long while for these quick-fire CPU launches, but also the toughest: whereas previously we would be able to line up a couple of rounds of extra testing, this year has been one launch after another.